This app a convenient way to have access to a large, scrollable format of the National Forest Service Sierra National Forest map. It operates totally offline after an initial download of the map data files. These maps were previously only available in very large print form, but now can be taken with you and can even tell you where you are on the map. 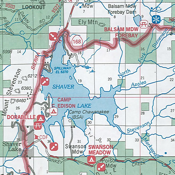 Other National Forest maps applications are on the way. Check out www.papermapsonline.com for more information.